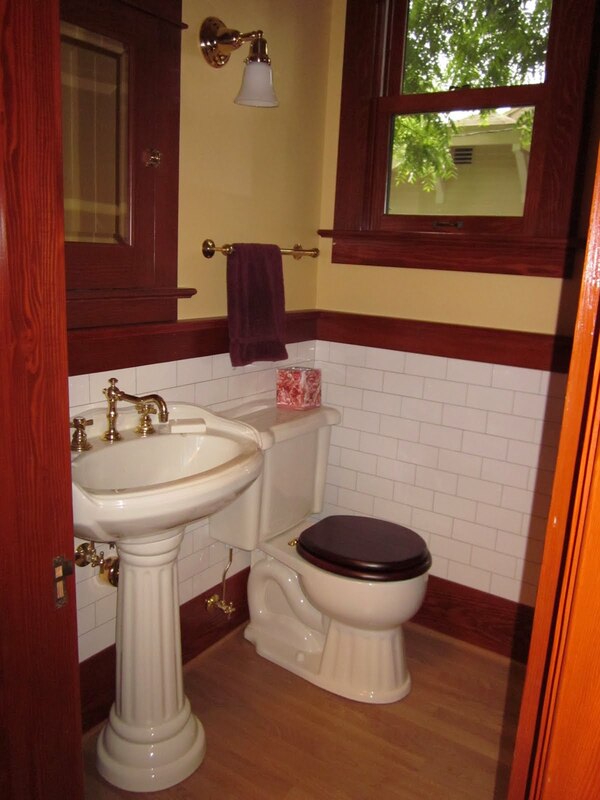 Unfortunately, we don't have good before photos of the main floor half-bath. It used to be really small; you could wash your hands in the sink while seated on the toilet. 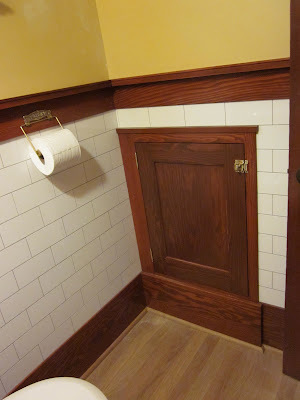 It had a 24" door and you practically had to sit down on the toilet to close the door. Needless to say, we enlarged the room a little bit. 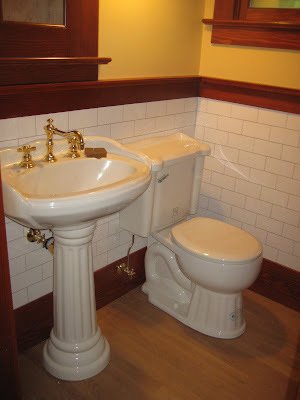 We took around 17" from the kitchen to make this bathroom a bit more usable. The window used to be centered on the wall and we didn't change the size of the window during the remodel. All of the woodwork in this bathroom is new flat-sawn fir. The fixtures are from the St. Thomas Creations Arlington line. 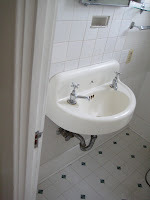 The faucet is a Newport Brass, Fairfield. The light was from Rejuvenation. The turn latches were from House of Antique Hardware. 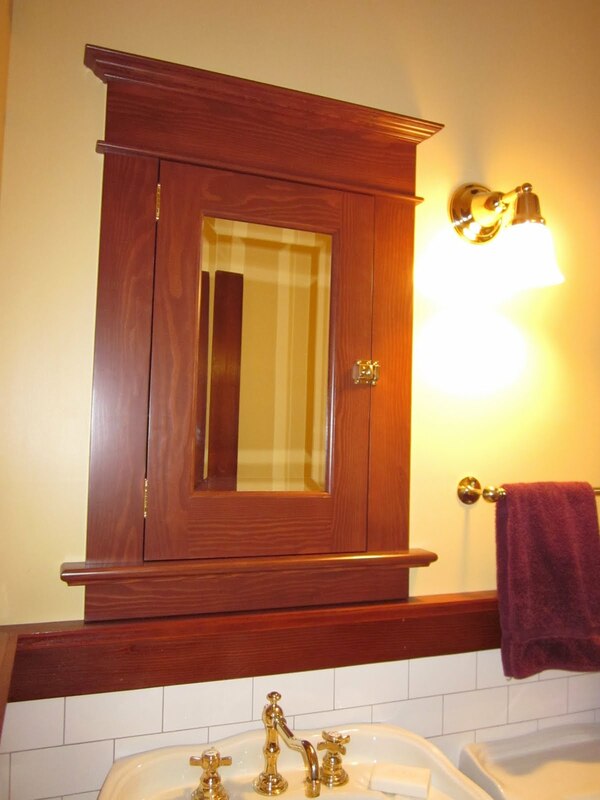 This medicine cabinet was custom made by the same woodworker who made the kitchen cabinets. Jeff and Sharon were quite delighted when they realized they could steal space out of the dead corner in the kitchen for a small linen cabinet. It still needs shelves inside. Though, Sharon is not too thrilled about the turn latch being installed incorrectly; it was supposed to be centered. Sigh. Probably can't fix it now. Here it is after the mirror was installed and we swapped out the toilet seat. You could center it for sure if you want. I had to do something similar to this. I used wood floor patch that was stainable and relocated my hardware. In my case it was a door hinge.